This year our holiday revolved around a teeny-weeny Halloweeny baby. Hunter was not at all sure about what was happening, but he is a go-with-the-flow baby, and really embraced the festivities. Yesterday we finally got around to doing our pumpkins. Yes, its a bit like decorating the Christmas tree on Christmas Eve, but hey, its all about better late than never. 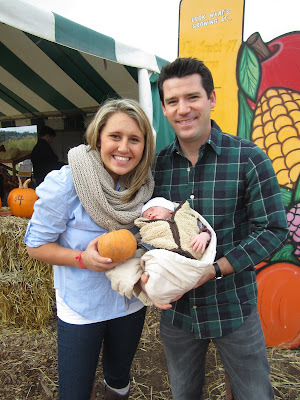 We actually went to the pumpkin patch over the weekend and picked out our pumpkins. We got Hunter his own baby sized pumpkin. Ketchum came too, but he had to stay in the car. There was a very large "No Dogs" sign posted, so he happily stayed in the car chewing his new buffalo bone. Luckily, we were en route to a very dog-friendly place; grandma and grandpa's house, so between his new bone and gma/gpa, he was a happy pup even without a pumpkin patch visit. Carving pumpkins was not on the docket this year, mainly because knives seem like a bad idea for an over-tired mom and a baby with little to no hand eye coordination. So I decided we would paint our pumpkins instead. You know babies, they love to paint. 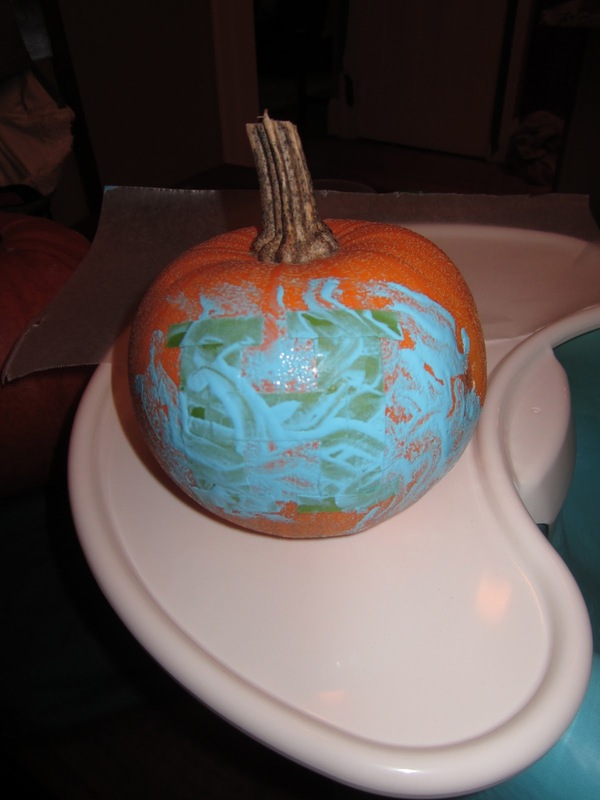 I taped an H on his pumpkin and a K on another (Ketchum needs a pumpkin too), and then we went to town with the paint. Hunter tried out his Bumbo seat, and actually liked it a lot. 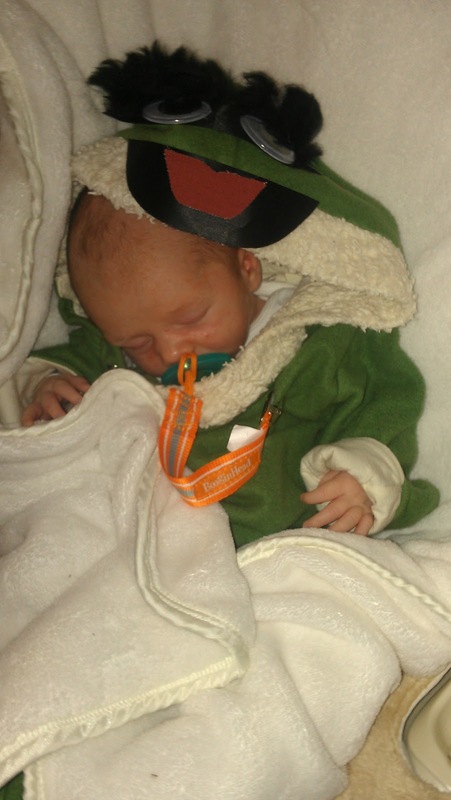 He is so little, that he could recline in the seat and it held him up perfectly, but of course I never left his side, and hovered over him like a good parent. What he didn't like so much was paint on his hands. I think the slimy texture was not his jam. Luckily he still did a great job of smearing the paint on the pumpkin. 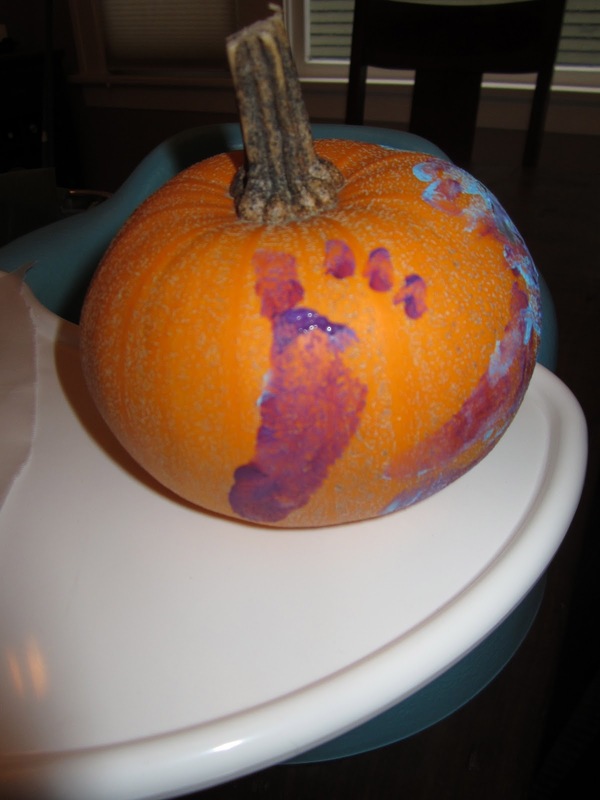 To finish things off, I decided to use his feet, which he much preferred, and I loved it because I got to see his little footprints memorialized on his pumpkin. Too freaking cute. Of course, once we got his footprints done, he went straight to the bath. After Hunter went down for his nap, I finished off Ketchum's pumpkin and peeled away the tape. They turned out great! 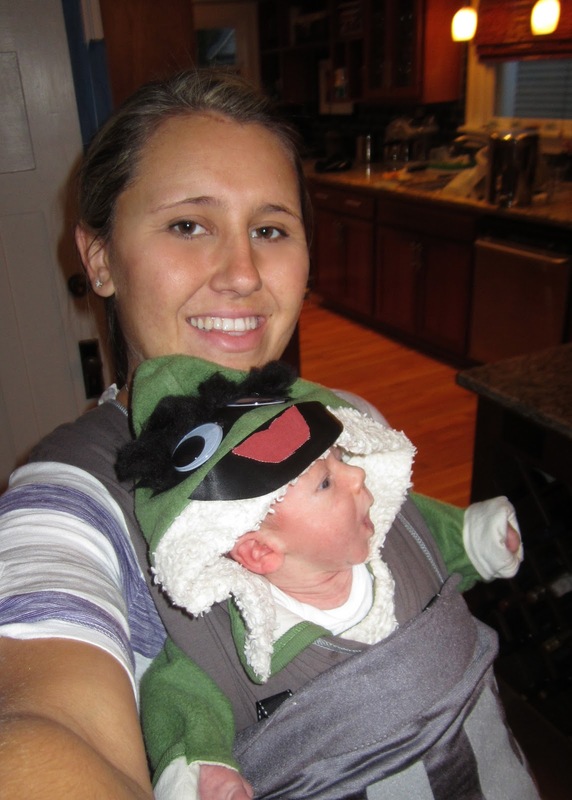 We stayed in and handed out candy to trick or treaters, and Hunter was the only one who dressed up. He went as Oscar the Grouch. My good friend Matt suggested it since we called him Oscar for so long, and it was a perfect idea. I was able to find a green baby outfit and I just glued on some eyes, eyebrows and a mouth, and whipped up a garbage can out of grey fabric I had laying around. I think it turned out pretty darn good for a use-what-you-have homemade costume. I tried to wear him in the moby wrap and pass out candy, but he was not having it. Mostly because he was tired. 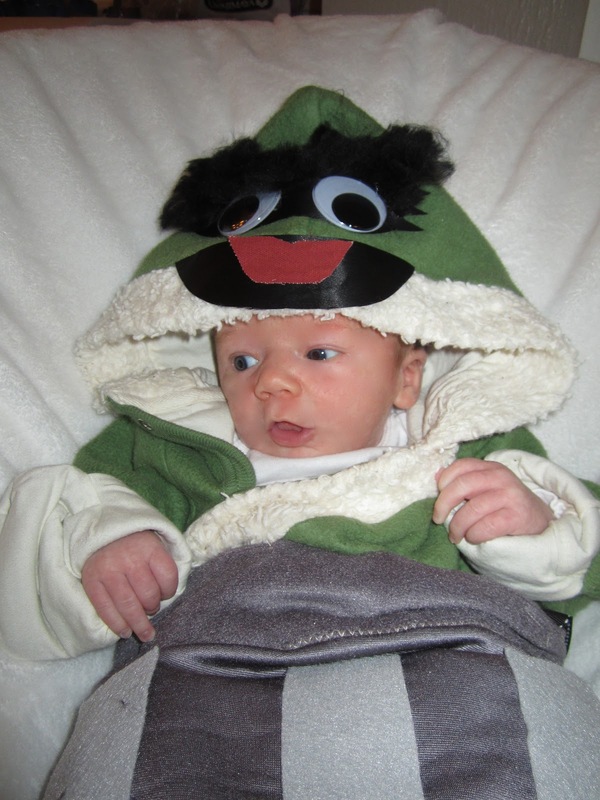 So the rest of the night, Oscar the Grouch was pretty snoozy. That is, until about 4:30am, then he was ready to party.